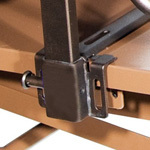 The half length T style bed rails by Drive Medical offer ideal, maximum protection without confining the patient. They are for use with Pan-Style beds and bariatric beds (models: 15300, 15302 and 15303) and will fit most manufacturer's beds. They are constructed of 1 in steel and feature and attractive brown vein finish. Protected by a limited lifetime warranty.